HealthGrid 2009 is well underway and has kicked off with a morning of workshops and afternoon of demo sessions at the dbb forum in Berlin. We've just seen a MediGrid demo from Tobias Knoch and Nick Kepper whose GLOBE 3D Genome Platform allows researchers to visualise DNA sequences, in a remarkable and stunning way. Analysing DNA is tricky business as researchers might have to work with around 10 million markers on a DNA strand - so without a supercomputer or a grid you don't get very far. 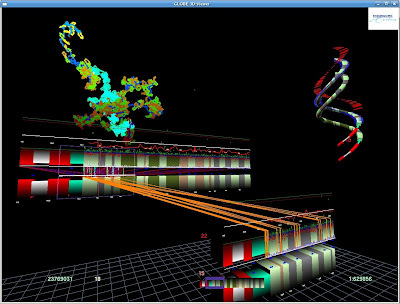 GLOBE 3D Genome Platform answers the question - how do we view this data in order to analyse it further? The team have created a virtual desktop behind which the grid is allowing researchers to both visualise and analyse these DNA sequences. Keep a look out for webcasts of the demos coming soon..